New York—Steven Brill bills himself as "the Wild Man" but doesn't look like one. Perched on his 10-speed bicycle, eyes shielded by a pith helmet and backpack loaded with gardening tools, field guides and botanical drawings, he more closely resembles the scholarly sort—bearded, bespectacled, articulate and quirky. But one habit sets him apart: Steven Brill eats weeds. Not only does he eat weeds, but to the everlasting consternation of New York Parks Commissioner Henry Stern, whose city park rangers hunt him as if he were a fox with designs on the henhouse, Brill is busy teaching other New Yorkers to eat weeds as well. He walks his students through the city's parks, where they collect mushrooms, nuts, berries and myriad edible greens and considers his work a public service. In Brill’s view, what the politicians are doing, locally nationally, is exploiting the environment for development and recreation that consists of nothing more than walking from Point A to Point B, then sitting down and having a beer and a cigarette." Brill, who calls Stern “a former city councilman with no training whatsoever in botany or the ecology,” especially objects to the Park Department’s determination to keep its open areas, from Central Park to the seashores of Brooklyn, pruned like lawns rather than allowing nature to take its course. Such pruning, Brill said, eventually will leave New York's green and wooded stretches eroded, sterile and devoid of diversity. dandelions. But he left office and Henry Stern came in, and he has the park rangers looking for me under the pretext that we are destroying the parks. My work doesn't harm the ecology. It brings people into the ecology. To protect the ecology is not having bureaucrats and politicians coming in with bulldozers." Steven Brill [left], who calls himself "the Wild Man," teaches New Yorkers how to live off the land, a practice New York City park rangers find extremely unpalatable. Many who follow Brill, and he said there have been thousands in the last five years, grew up in New York's concrete canyons thinking vegetables grow in cans. They are fascinated at the prospect of dining from what most of the world considers a weed patch fit only for hoe and herbicide. A recent foray with Brill that ranged from Forest Park in Queens to the shores of Jamaica Bay, with a dozen students in tow, netted a banquet of horse mushrooms, puffballs, amaranth (better known as pigweed), lamb’s-quarters, Asiatic day flower, wood sorrel, sweet wild plums, and a bushel of butternuts. Stern, however, was not impressed when told that the day's take, drawn at Brill's insistence from only a fraction of each patch, with nothing uprooted, was delicious. Why indeed? With an estimated 14,000 restaurants in Manhattan alone and with a produce stand on practically every street corner, why would anyone want to forage? Brill's chief concern, however, is the one group he said he finds hardest to educate. They're the poor and the hungry who could improve their diets with the sort of knowledge he passes out on his foraging expeditions. Brill charges $15 a head for his trips, but poor people, when he can get them interested, go along at no charge. Because Mother Nature's pantry contains the toxic as well as the tasty, a foray with Brill takes on a genuine flavor of adventure, leaving the novice forager with that superior feeling that always comes with finding out something most people don't know. Brill, 36 and a confirmed vegetarian, did not start out to become a naturalist playing Peter Rabbit to Stern's Farmer MacGregor for a living. He entered George Washington University as a premed student but switched to psychology halfway through and wound up taking every botany course he could fit into his schedule. It was, he said, memories of summer camp when he was a child growing up in Queens that eventually led him to his true vocation. Brill's apartment is nothing if not organic. It is a clutter of drying racks, ovens, pulp extractors and packets of clay from which its owner sculpts mushrooms of every species. He also gets by by keeping a sharp lookout for Stern's rangers and leading his clients deep into forested parks where the arm of the law seldom ventures. Being caught is costly. “Whenever we catch him, we fine him and he pays the fine, yet he conducts these forays repeatedly,” said Stern. MUNICIPAL ONION in mouth, Steve Brill displays dining style in Queens park. It had all the earmarks of yet another major undercover probe: plainclothes operatives, marked bills, surveillance cameras and a suspect ripping off the city-literally. 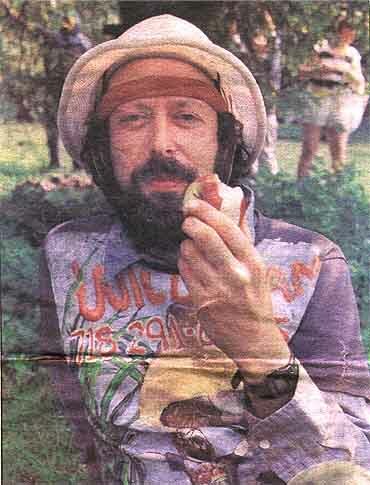 The target: Not Stanley Friedman or Michael Lazar, but a self-styled edible-herb specialist, Steve (Wildman) Brill. His crime: Snatching and eating dandelion greens from the meadows of Central Park. The chief investigator: Parks Commissioner Henry Stern, who just couldn't stomach the idea of anyone, in his words, "eating our parks." 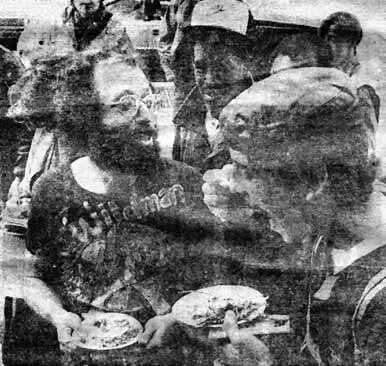 Brill generally charges $15 or $20 per person, and until 1983, he says, the Parks Department approved his course on eating in Central Park at prices far lower than Tavern on the Green. But that year, according to Brill, Stern began refusing to grant him his permits to pick weeds legally. Brill insists there are such permits. "Steve Brill charges people $20 to take them around and have them cut our plants and flowers," says Stern. "It's not allowed. We asked him to stop, but he wouldn't stop." And so, last Saturday, two undercover urban park rangers paid Brill $40 in marked bills, infiltrated his tour and took pictures of him at work. As the tour broke up, two officers arrested Brill on a charge of criminal mischief. He was whisked to the Central Park station house, fingerprinted and made to cool his heels for three hours before being given a desk appearance ticket to appear in court April 18. A spokesman for Manhattan District Attorney Robert Morgenthau, perhaps waiting for the case to ripen, declined comment. "It's bullying," says Brill. "Stern should know that the more dandelions you pick, the more grow back. I'll keep taking my classes to the parks." Stern says his policy is: "Please don't eat the daisies-or the dandelions. It's against the law." Two park rangers disguised as nature lovers used a camera to get their man-bespectacled botanist Steve Brill, a.k.a. "Wildman," who was duly handcuffed and hustled down to the precinct in a police van. The charge? Eating the flora in Central Park. Brill confessed in a telephone interview today. "We picked dandelions and a few other common weeds. We ate a few high-bush cranberries. . . a little bit of water mint . . . and some daylily shoots." For five years, Brill has been conducting four-hour $15 walking tours of city parks, showing urban dwellers the edible plants. They fill their bags with delicacies such as wild black cherries, carrots, blueberries, water mint, mustard and even coffee beans. Brill, in his trademark white pith helmet, offers recipes along the way. The Parks and Recreation Department says Brill was warned several times to quit. When he refused, the law moved in. Brill was taking a college ecology group on an edible tour Saturday afternoon, paying little heed to the couple who "acted a little strange." "They didn't interact or pick anything. They were a little bit stiff, and sort of quiet. They just kept taking pictures," Brill recalled. "I kept holding up plants for the guy to photograph." The couple turned out to be undercover rangers who radioed for backup at the end of the tour. Uniformed Parks Enforcement officers arrested Brill on criminal mischief charges. "I had nothing in my bag-no digging tools or anything," Brill said. "God forbid I would have had a dandelion in my backpack. I'd still be in jail. . . . I'm just trying to get people into nature, to show them they can touch things and smell things and taste them." "Parks are to look at," said Parks Commissioner Henry Stern. "Our motto is 'Please don't eat the daisies.'" A sting operation was mounted over the weekend, not in a darkened alley or smoke-filled room, but in the sunlight of Central Park. Park rangers, disguised as ordinary folks. took the tour offered by Steve Brill. who gives walking lectures on the edible plants there. The group was made up 11 members of the Columbia University Earth Coalition, an environmental organization, and the two rangers. The rangers paid $20 each, in marked bills. At the end of the tour, Mr. Brill was arrested by parks-enforcement patrol officers, handcuffed, searched and transported to the Central Park Precinct, on the 86th Street transverse. “It's a violation of park regulations,” the Parks and Recreation Commissioner. Henry J. Stern, said. "You don't want people eating up your park." Mr. Brill violated section 145 of the Penal Code and Park Regulations 6, 16 and 29, for several offenses, Mr. Stern said. He received a desk-appearance ticket and was not booked. The people in the Earth Coalition fear Mr. Stern might put an end to Mr. Brill's walks. “We've gone along with the expeditions, to learn about edible plants and how to preserve them,” Prof. David E. Shaw of Columbia said. “That's the irony." NATURALIST Steve Brill (man with glasses) offers passersby samples of his weed salad with mushrooms near courtroom. He was arraigned yesterday on charge of criminal mischief for allegedly picking the flora in Central Park. Weed-eater Steve Brill refused to turn over a new leaf yesterday. Brill, a naturalist who dines on dandelions and vines, was in Manhattan Criminal Court to answer criminal mischief charges. Last month, two undercover park rangers spotted him digging weeds in Central Park and slapped him with a summons. Judge Mary Benedar put Brill's case off until May 7. Then she instructed him to stop eating weeds yanked from city soil and smooth things over with Parks Commissioner Henry Stern, who gets rather upset about people putting flora from the parks in their mouths. Minutes after he left the courtroom, the irrepressible Brill was standing on Centre St. Offering passers-by samples of a concoction called Five Park Salad. The ingredients included wild spearmint, Japanese knotweed, wild chervil and chick weed. "Did you pick this stuff out of city parks?" asked a nosy reporter. "No, no, say no comment," yelled Brill's lawyer, Justin Reichbach. A fellow named Nikos, who operates the hot dog cart outside the courthouse, was not impressed when offered a salad sample. "It's like eating grass," he said. "Crazy people. They should eat hot dogs. Much healthier. Much better. Stern seemed surprised by the whole scene. "I met with Steve on Wednesday, and told him we would hire him to give tours of the parks-but only if he left his gardening tools at home," he said. Stern said the offer stands. He also said the Parks Department would ask the court to drop the charge against Brill if he agreed. "He wouldn't have to stop eating," Stern said. "We would allow him to dig up certain mutually agreed-upon weeds, like dandelions, that are overabundant. But he's got to remember that our parks are not supermarkets." A détente has been reached between the Parks and Recreation Department and Steven Brill, the self-taught environmentalist arrested for picking edible plants in Central Park this year. Mr. Brill is to lead his first official tour this morning as a Parks Department naturalist. Among those on the tour will be the Parks and Recreation Commissioner. Henry J. Stern. A court appearance May 2 was postponed, and now the department will drop the charges against him, Mr. Stern said. “Mr. Brill has promised to confine his appetite to plentiful species,” according to Mr. Stern, “and those approved by the Parks Department as a surplus,” Dandelions and mulberries, for example. He will be paid $15 an hour. Next weekend Mr. Brill will begin leading free walks in several parks pointing out edible plants. For information on his schedule, call (718) 291-6825. “My walks are wild-food walks,” Mr. Brill said. “I’ll be picking the most common plants and leaving the rare plants alone." Everyone seems happy with the solution. “He'll have regular employment,” Mr. Stern said. 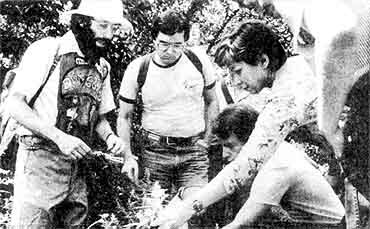 “The public will have his ecological knowledge and the plants will be eaten, and we will have a devoted employee to raise people's consciousness without breaking the law." Together with a small group of accomplices, the bearded, bespectacled and very gentle Brill gathered a few leaves and stalks of mugwort, violet, burdock, curly (yellow) dock and common plantain on a walk through Central Park. Three weeks before, the 37-year-old expert, enthusiast and advocate of wild edible plants was arrested, handcuffed and booked for the criminal misdemeanor of picking and eating weeds in the park. Just two days before, he was arraigned ("not guilty, Your Honor") in Criminal Court, much to the delight of observers who relish the absurdities of the law. But Wildman's tour on Sunday was sanctioned by the Parks Department. At the West 72nd Street entrance to the park, Janice Melnick, acting director of the Urban Park Rangers, explained the situation. There was to be no eating on this trip ("It's a question of liability, in case someone gets sick," Melnick said with only a trace of embarrassment) and a park ranger would go along to make sure. The department is working out a set of guidelines to allow Brill to guide his clients in their search for the edible garlic mustard and the not-so-edible marsh marigold (it has to be boiled twice and drained to get rid of its noxious properties). The department, Melnick said, will probably drop the charges. "Their lawyers are talking to my lawyer," Brill added. He is defended by Gustin Reichbach, who noted that the official charge of Criminal Mischief, Fourth Degree, involves intentionally damaging the property of another person. Brill, Reichbach said, is careful not to damage because he picks with discretion. 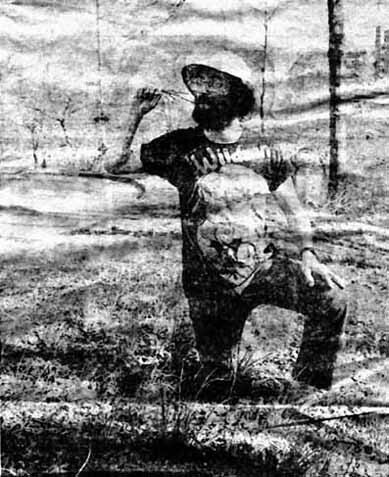 Brill became "Wildman" about four years ago when he began lecturing and writing about the subject he has been studying for years. "You should never eat anything without being absolutely certain that it's safe-or have someone else try it first" he said. Brill learned about berries from his mother when he was a boy in Queens. But he started a serious pursuit of edible plants after he saw a group of Greek women picking wild grape leaves. He began conducting his tours in the city's parks, beaches and lots in 1981. Lectures in public libraries, botanical gardens and exhibitions of his sculpture of mushrooms followed. The tours, he said are publicized through flyers in health food stores, word of mouth, and most recently by his getting arrested. He also wears a black T-shirt (painted in wild colors and patterns by his girlfriend, Evelyn Dean) with his Briarwood, Queens, phone number-718 291-6825. Brill's tours cover the folklore, chemistry, ecology and harmony of common plants, with the emphasis on touching, picking, squeezing, smelling and ultimately eating the subject. The fee, he said, is on a voluntary basis: the suggested price is $15, but he has never turned anyone away. "You only pick plants where there are many," he cautioned, even if the species is common. It's important to preserve a particular stand of a weed in order to visit the spot at different times of the year to observe its varied stages. For a biennial like the burdock (the deep root is delicious but hell to dig up) you have to wait two years before you see the small purple thistle atop the tall stalk. Although sympathetic to parks department concern about preventing citizens from damaging the commons, he thinks the city goes to far with the policy of "look but don't touch." In fact, he said, indiscriminate mowing of weeds and over-pruning by the Parks Department itself causes considerable damage. In Jamaica Heights Park, he said, department workers pruned down to the ground a relatively rare spice bush. I left the Parks Dept. after Parks Betsy Commissioner Betsy Gotbaum, who refused to meet with me or reply to phone calls or letters, tried to quash the most successful environmental education program in the history of NYC. After weeks of harassment and abuse from her underlings, I had more than I could digest. Notifying the press during the Memorial Day weekend, when the Parks Dept. upper echelon is incommunicado (this was long before the Internet and e-mail), and quitting the morning after the weekend, reporters caught an unprepared Gotbaum by surprise. This strategy worked: one of the objections to foraging she repeatedly blustered to the press was carbon monoxide contamination. Most people know that carbon monoxide is the toxic gas that suffocates people running car engines in confined spaces, not by settling on dandelions! Avoiding further bad PR, she never carried her threats to go after me for the duration of her regime. 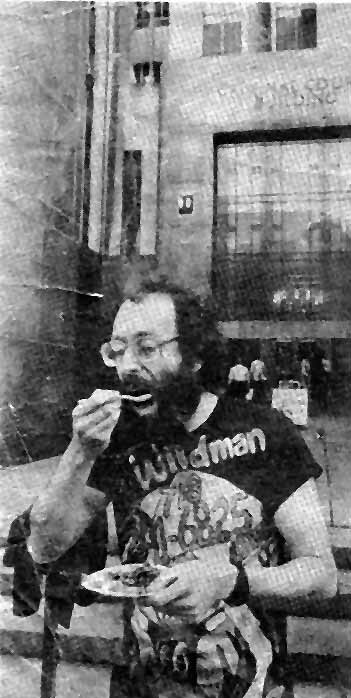 Foraging with the "Wildman", WBAI Radio, NY, June 1990, Hosted by "Wildman"
"Wildman" Steve Brill, a forced-out Park Dept. naturalist, continues his foraging field trips in the borough's parks, despite opposition from the powers-that-be. The Tribune followed the Queens botanist on a recent excursion into the wilds of Cunningham Park. This can't wait until the next time we ride circus racing elephants together in Flushing Meadow Corona Park. I write now to urge you as parks commissioner to interdict "Wildman" Steve Brill. I make this call for mobilization after witnessing his incursion into Cunningham Park woods last Saturday. For Brill, the foray was another return to his life's "turning point." A podiatry school dropout and a one-time tournament chess player and a student of culinary arts, Brill was biking through Cunningham Park one day in the mid-1970s when he spotted some Greek women foraging in the woods. "They showed me how to collect grape leaves and made me aware that more wild food than berries (which my mother had shown me) grew in parks. This was a turning point." So on Sept. 1, 1990, deep into the wilds of northeastern Queens, away from the civilized traffic of Francis Lewis Blvd. and Union Tpke., the Castro-bearded revolutionary led a battalion of his followers (Brillos?). Equipped with knapsacks and/or plastic and paper bags, magnifying glasses, and copies of his illustrated manual for identifying edible and poisonous plants, they marched for hours, far from the beaten paths, living off the land. These were clearly guerilla maneuvers, albeit consistent with that jungle species' vegetarian diet. I know you said you didn't want 'war' with Brill. That was back in June when he resigned as a Parks naturalist rather than submit to the mind-constricting benefits of bureaucratic discipline. Your agency was quite correct to insist he punch a time clock, take one-hour lunches at prefixed times, submit for approval all correspondence connected with the parks foraging study program he created, and desist from engaging in art exhibits promoting the program. Exceptions from procedural routine for the sake of creativity and spontaneity cannot be tolerated. That would run counter to the kind of civil service mentality which such regulations seek to inculcate. The individualism he demonstrated in 1982 as a private citizen devising park excursions spotlighting weeds as wondrous things to touch and taste should have been sufficient to identify him as a subversive influence threatening our urban lifestyle. Your predecessor Henry Stern, unlike his forerunner Gordon Davis, initially recognized the implicit danger posed by Brill acquainting city denizens with the delights of dandelions. 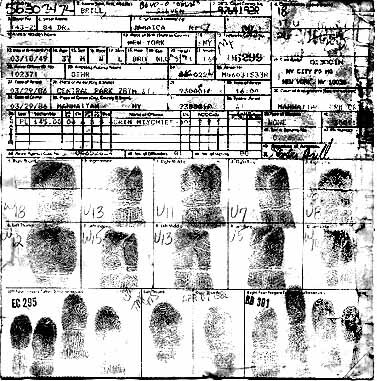 Whereas Davis granted Brill permission for hands-on field walks in city parks, Stern had Parks Rangers conduct an undercover and underbrush investigation leading to the botanist's arrest March 29, 1986, on criminal mischief charges: to wit, munching wild onions. Up to that point Stern had been properly stern. But then under a landslide of editorial lambasting, the commissioner wilted and let Brill wangle a job as city parks naturalist to do legally what he had been arrested for allegedly doing illegally. This surrender to the ecological adventurer continued nearly four years until your appointment as parks commissioner early this year. Soon thereafter Brill was sent word to shape up, snap to, and salute or ship out. When the rule-book squeeze succeeded in' forcing his resignation, accompanied by his announcing plans to resume private foraging tours in the parks, you promptly fired off a letter reminding Brill of Article Ill Section 7a. It bans removing vegetation without your permission as commissioner. Your closing phrase ("... and I will not grant permission for you to do so") will long ring through the annals of parks' history. It was the gauntlet tossed down, the line drawn in the sand, the chip placed upon the shoulder. Bully show, Betsy: you're quickly becoming New York's own Margaret "Ironlady" 'Thatcher! But incorrigible Brill still bounds through brambles and trudges through thickets, heeding not your prohibitions; he and his devotees continue eating wild berries, thereby giving your words the raspberry. Saturday they started, two dozen strong, or reasonably so considering the grey hairs predominating. There were some old-hands and a few novices, going bravely where no joggers and muggers have gone before, into seemingly virgin parkland unrecognizable as department property due to the absence of garbage, graffiti, and disrepair. The cultural shock inflicted upon the city dweller's psyche by such exposure must not be underestimated.